Baby's skin feels soft and smooth next to the organically grown cotton Muslin Multipurpose Cloths. They are absorbent for cleaning up sniffles, drips, drools and messes. These handy cloths are generously sized and practical for everyday use as wipes, burp cloths and so much more. 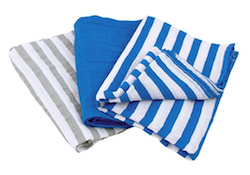 Available as a multi-pack with bright, fun colors in striped and solid designs. For multipurpose use - protective layer for changing table, burp cloths and more. Super soft & softer with every wash.